Saturday we went to Grandpa & Grandma C's house for Sir's birthday party. He requested a Black Forest cake, and Bashful kindly placed the candles that I grabbed from my candle stash decoratively on the cake. 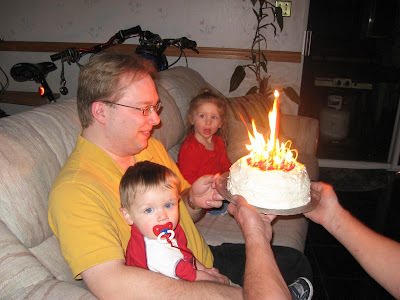 Then Grandpa C. lit the candles and I got my camera ready to photograph at least part of the evening. As the above picture shows, my candle stash was a little different this year. I think this was the best 'blowing-out-the-candles' event I've ever experienced, and I'm so glad I was able to photograph it! Enjoy! 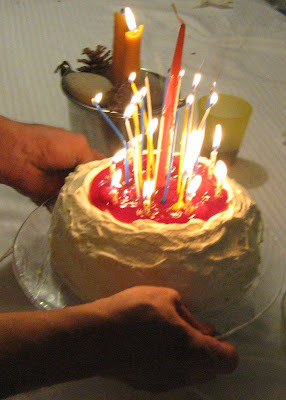 The short candles started setting fire to the tall candles thus creating an interesting effect. 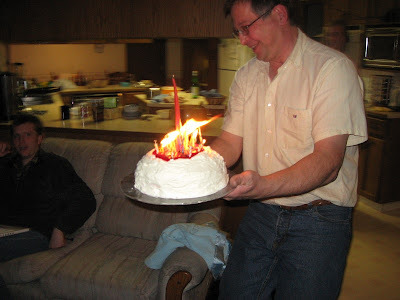 After a few seconds of attempting to keep all the candles lit in their proper places, Grandpa C. changed his mind and decided to just rush the brightly lit cake to Sir to quickly blow out. At this point, the flames were so bright that my camera didn't even use the flash. I don't think I've ever laughed so hard at a birthday party in my life! 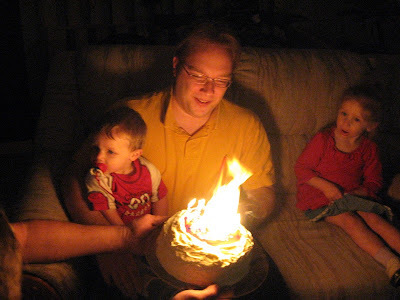 Sir finally caught enough breath to blow the candles out after the final flare up you see here. PC still looks dazed, and Dolly looks like she's not so sure she wants a birthday party this year... or maybe just a party without cake? That's so cool that you caught pictures of all that! Looks like fun . . . since nothing else caught fire! Hilarious! What a crazy birthday cake experience! Happy birthday to Sir and tomorrow to Dolly!